PhoenixMart is purpose-built to maximize manufacturing, retailing and wholesaling efficiency. As the most comprehensive global product marketplace in the Western Hemisphere, PhoenixMart will provide solutions for a wide array of tenant and buyer’s needs. 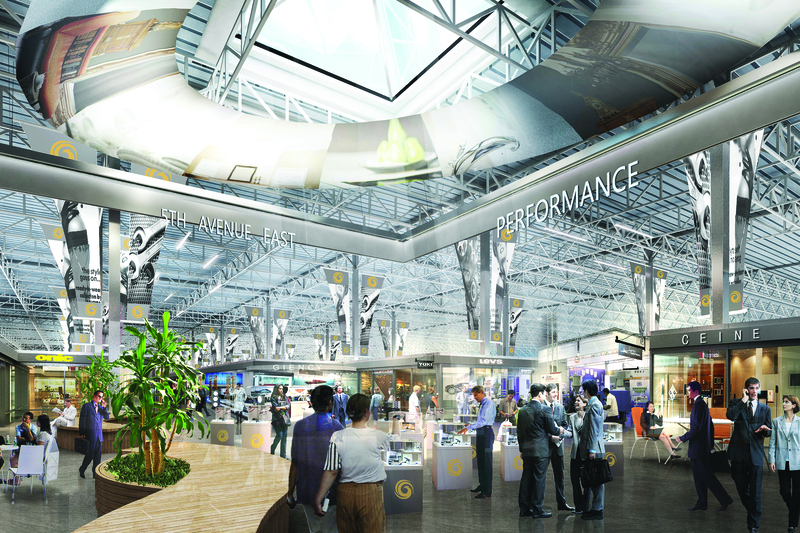 PhoenixMart is a global product marketplace which will consist of over 1,800 showroom suites. Similar to other global marketplaces overseas, visitors will have the opportunity to purchase manufactured goods and products from a vast selection of international and domestic companies. At PhoenixMart, buyers will be able to connect directly to the source by meeting with representatives from the manufacturers, distributors and material suppliers. Serving as a hub for buyers and sellers from around the globe, PhoenixMart will also host meetings, trade events, and seminars. How did the idea for PhoenixMart come about? PhoenixMart is modeled after existing successful marketplaces such as Yiwu Market in China and Dragonmart in Dubai, both of which host thousands of daily visitors. The quality standards of product offered at PhoenixMart will be superior to the merchandise sold at the overseas marts. By offering an extensive worldwide selection of quality products at competitive prices in numerous categories, PhoenixMart will distinguish itself as the go-to location for wholesale products in the North American marketplace. How is this business model of combining manufacturers, distributors, and wholesalers in one location, different from or better than other existing models? What are the advantages of having everything in one place? Designed with a world-class standard in mind, PhoenixMart will attract global wholesale buyers and sellers. PhoenixMart will create a business hub that includes product manufacturers, suppliers, and distributors. Efficiency is the top priority. For example, a hotel developer can visit PhoenixMart and conveniently source from an extensive worldwide selection of quality brands and products at competitive prices, in order to stay within their budget. They’ll be able to find everything they will need to develop their hotel, from electronics (phones, televisions, computers, etc.) cabinetry, lighting, curtains, beds, linens, and even complete kitchen supplies. Do I need to relocate my business? How do I staff my suite? Some tenants may choose to make their PhoenixMart sales office a major part of their future business plans, however it is not required that a business relocate. Tenants simply need to have a manned office/product showcase suite. This can be done through a variety of ways, from staffing the suite with a current employee to utilizing the PhoenixMart HR and on-site staffing service to assist in hiring a representative. Why is it based in Arizona, and more specifically, Casa Grande? What was the thought process behind choosing that location? The accessibility in this region is ideal for PhoenixMart’s development. As one of the fastest growing areas in the U.S. in both population and employment, the Southwest, and Arizona in particular, provides an attractive destination and a ready, qualified workforce. It is also home to several Fortune 100 companies. The area was also chosen because it is strategically positioned near several key interstate freeways, airports and rail lines and is directly in line with the proposed NAFTA freeway running from Mexico to Canada, allowing for efficient importation and exportation of goods. What kinds of tenants will the center have? PhoenixMart is seeking to select the optimal tenant mix. Great care has been taken to acquire a balance of small, medium and large companies, as well as a vibrant mix of domestic and international tenants throughout all of the product categories. Once completed, PhoenixMart will include thousands of companies within our tenant suites, yet the real opportunity is much greater.